Black Lawrence Press, 9781625579447, 175pp. "You should be here; he's simply magnificent." These are the final words a biologist hears before his Margaret Mead-like wife dies at the hands of Godzilla. The words haunt him as he studies the Kaiju (Japan's giant monsters) on an island reserve, attempting to understand the beauty his wife saw. "The Return to Monsterland" opens Where We Go When All We Were Is Gone, a collection of twelve fabulist and genre-bending stories inspired by Japanese folklore, historical events, and pop culture. In "Rokurokubi", a man who has the demonic ability to stretch his neck to incredible lengths tries to save a marriage built on secrets. The recently dead find their footing in "The Inn of the Dead's Orientation for Being a Japanese Ghost". In "Girl Zero", a couple navigates the complexities of reviving their deceased daughter via the help of a shapeshifter. And, in the title story, a woman instigates a months-long dancing frenzy in a Tokyo where people don't die but are simply reborn without their memories. Every story in the collection turns to the fantastic, the mysticism of the past, and the absurdities of the future to illuminate the spaces we occupy when we are at our most vulnerable. 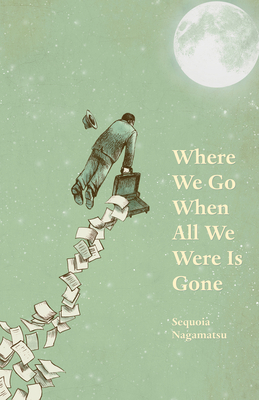 Sequoia Nagamatsu is the author of the story collection, Where We Go When All We Were Is Gone (Black Lawrence Press), silver medal winner of the 2016 Foreword Reviews’ Indies Book of the Year Award. His work has appeared or is forthcoming in publications such as Conjunctions, ZYZZYVA, Electric Literature’s Recommended Reading, The Fairy Tale Review, Tin House online, Black Warrior Review, Willow Springs, The Bellevue Literary Review, Lightspeed Magazine, and One World: A Global Anthology of Short Stories, among others. Originally from Hawaii and the San Francisco Bay Area, he was educated at Grinnell College and Southern Illinois University. He co-edits Psychopomp Magazine, an online quarterly dedicated to innovative prose, and teaches at St. Olaf College and the Martha’s Vineyard Institute of Creative Writing. He is currently working on a second story collection and a novel. Sequoia Nagamatsu’s universe is one in which modern Japan and its ancient folklore play in the same delightful puddle. Creepy, unnerving, and full of heart, these tales of love and demons, death and Godzilla, loss and possibility, will creep into your dreams and enchant your imagination. These stories deftly breathe new life into the myths and pop culture of an older Japan, bringing them into the modern world and directing them in unexpected ways. It’s hard to tell if Nagamatsu holds nothing sacred, or if he holds everything to be. In either case, the effect is the same: these are deft atmospheric romps that a hell of a lot of fun but also worm their way under your skin before you know it. An addictive and compelling debut.